United Merchants and Manufacturers, Inc.
S - Z > United Merchants and Manufacturers, Inc. 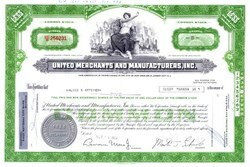 Beautifully engraved certificate from the United Merchants and Manufacturers, Inc. issued in 1970-1974. This historic document was printed by the Columbian Banknote Company and has an ornate border around it with a vignette of an allegorical woman with a city scape in the background. This item has the printed signatures of the company�s president and secretary and is over 26 years old. United Merchants and Manufacturers, Inc. ("UM&M" or the "Company") is a diversified company engaged principally in the manufacture and distribution of apparel textiles and the design, manufacture and distribution of accessories. The Company also operates 51 discount outlet stores which sell the Company's and other manufacturers' products. The Company's operations are located in the United States. The apparel textiles segment consists of the Company's Buffalo Mill, an integrated yarn-spinning and weaving mill focused primarily on products for the apparel market. The Buffalo Mill, located in South Carolina, produces a wide variety of blended yarns, including specialty yarns, and weaves fabrics mainly from the yarns which it produces. The segment competes with a large number of small concerns, as well as large integrated enterprises. In addition, low-priced imports and fluctuations in the greige market are a significant factor impacting margins. The principal factors of competition consist of quality, styling, service, length of delivery cycle and price. At June 30, 1994, this segment had approximately $9,670,000 unfilled orders believed to be firm, all of which are expected to be filled during the current fiscal year, compared to approximately $16,620,000 at the end of fiscal 1993. The Company's accessories and apparel segment consists of it's 79% owned subsidiary, Victoria Creations, Inc. ("Victoria") and a chain of 51 discount retail stores. Victoria is one of the leading designers, manufacturers and distributors of costume jewelry throughout the United States and also exports such products, principally to Japan and Western Europe. Victoria produces a broad range and assortment of costume jewelry, including relatively expensive, high quality items sold under the Bijoux Givenchy(R), Richelieu(R) and Karl Lagerfeld(R) trade names and private label jewelry for major department and chain stores. Victoria markets its products using its own sales force throughout the United States, primarily to department and chain stores and, to a lesser extent, to mass merchandisers and mail-order distributors. In addition, Victoria has established a factory direct business to design and manufacture unique and proprietary costume jewelry-type items for certain customers. The costume jewelry industry is highly fragmented and includes many small firms. The Company believes that Victoria is one of the largest manufacturers of costume jewelry in the United States. Within the industry, there are manufacturers that focus on low-margin, basic items and those that emphasize higher-margin (and higher risk) items geared to be highly fashionable. The Company believes that only a few companies, of which Victoria is one, combine manufacturing and marketing capabilities for both basic and high fashion items. Victoria competes on the basis of design, quality, reliability as a supplier, service to the customer and price. Its major competitors are the Monet, Marvela and Trifari divisions of Crystal Brands, Inc.,Anne Klein division of Swank, Inc., Liz Claiborne, Inc. and Napier, Inc.
United Merchants and Manufacturers, Inc. and its Victoria Creations subsidiary filed for Chapter 11 in 1996.